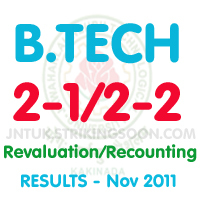 JNTU-KAKINADA , B.Tech 2-1 & 2-2 Regular/Supple EXams Revaluation/Recounting Results (Nov/Dec 2011) Of The Regulations R10,R07,R05,RR.Very few Candidates are passed out of those who applied for Re-counting & Re-valuation , hence we had placed the results of passed candidates only. Download The Excell Sheet By Clicking On The Corresponding Download Link. While Opening the file it ask's a password,then click on "READ ONLY"
Click on "Read Only" if it promots to enter any password when u open the file. ** We Are Not Responsible For Any Consequencies !